“In 1994 and 1996, I [Riskin] published two articles that proposed a system for understanding mediators’ orientations, strategies and techniques. The system employed a grid composed of two continuums. One measured the role of the mediator; the terms evaluative and facilitative were its anchors. The other continuum had to do with the mediator’s approach to problem definition, and it ran from narrow to broad. When I put these two continuums together, a grid appeared, and I posited that the quadrants showed mediator orientations: Evaluative/Narrow, Facilitative/Narrow, Evaluative/Broad and Facilitative/Broad. 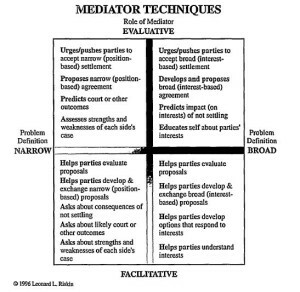 This system of understanding mediators’ approaches has been used widely in training, evaluating, regulating and choosing mediators.” Leonard L. Riskin, Who Decides What? Rethinking the Grid of Mediator Orientations, 9 No. 2 Dispute Resolution Magazine 22, 22 (Winter 2003).